away in the garage for another year. I know 2016 will bring more interesting and joyful things too. Here in Northern California we can use every drop we get. I designed this Winter wreath with the the stormy weather in mind. and my wreath blown down the street. 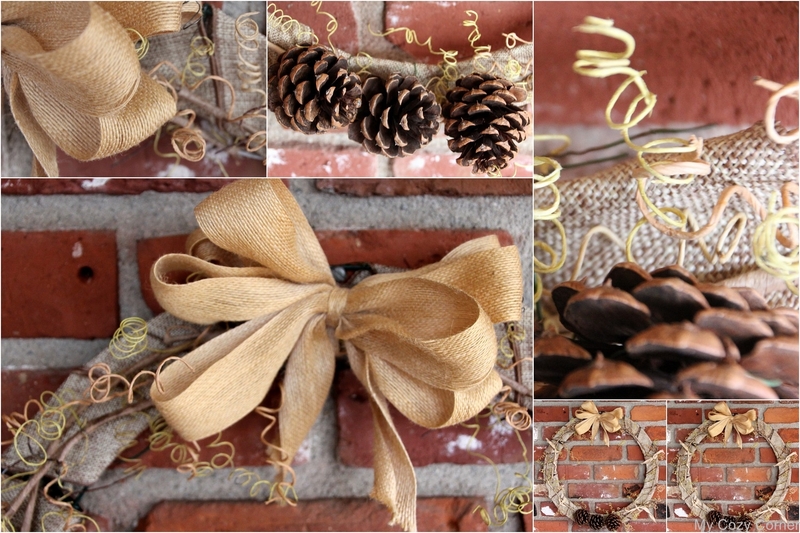 This Winter wreath is simple and expresses the stark look of winter. Wired ribbon wrapped around a metal wreath frame. Some grape vines tied to the wreath. Hopefully it will safe on the porch for a month or so. I am ready to get this blogging year started. Please stay warm and cozy. What a darling wreath and very fun! I love a wreath on the door or the house! I always have trouble keeping wreaths on the door because we live in a very windy area. I can't decorate outside the house either for the same reason. It's a wonder they don't call us the Windy Island! Thanks for sharing and joining me for my little party. I like your winter wreath. Very simple and charming. Well done! Your winter wreath is LOVELY Thanks for sharing. I love your Winter wreath.. It has a warm rustic feel to it. I am dropping by via Northern Nesting...share your style. I am following along with you.. Come on by and visit.. Blessings! I love this! Simple, rustic, warm... I would love to have you post on my blog hop—the Weekend Blog Hop at My Flagstaff Home (www.myflagstaffhome.com). It begins on Thursday evenings and lasts through the weekend, if you're interested.